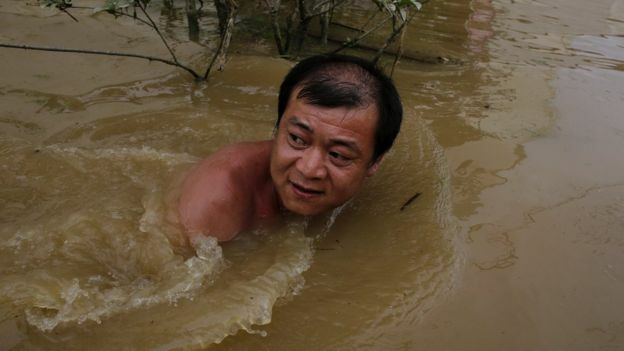 Intense downpours have caused huge losses along the Yangtze River drainage area in recent days, and more rain is expected to batter the region along with the first typhoon this year, according to authorities. Heavy rains have left 186 people dead and 45 missing in 26 provinces, regions and municipalities across the country as of Sunday, causing a loss of 50.6 billion yuan ($7.59 billion), the State Flood Control and Drought Relief Headquarters said. About 33 million people were affected by the rain and rain-triggered floods, and 1.48 million people have been relocated across 1,192 counties in 26 provinces. The rain and flooding has destroyed 56,000 homes, reports ecns.cn. Compared to the same period in 2000, the number of areas and people affected has reduced. The number of people killed and homes destroyed reduced dramatically, but the direct loss increased significantly, by 51 percent. Because more rain has been concentrated on the country's southern, eastern and northeastern parts, floods could occur along the Yangtze, Songhua and Huaihe rivers this summer, an official from the headquarters said. Authorities have predicted water will exceed warning levels at the middle and lower reaches of the Yangtze River and the upper and middle reaches of the Huaihe River from Sunday to Tuesday. Two rounds of rain could occur in next 10 days along the middle and lower sections of the Yangtze River and Huaihe River drainage areas.